What is a Stripping Run ? When distilling moonshine the stripping run is often the first distillation of the mash. The goal of this first distilling run is to strip as much alcohol from the mash as possible. This distilled alcohol is often referred to as “low wines” and what’s left over in the boiler is the bulk of the water, sediment and yeast from the fermentation process which can be discarded. A pot still is often used for this distillation process and is run hot and fast, No cuts are made during the run so the separation between fractions is bad. It’s common to see a stripping run abv range between 40% – 60% abv. 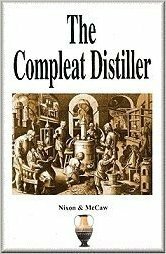 Why Should I Do A Stripping Run Before A Spirit Run ( Primary Distillation) ? The Stripping run allows you to significantly reduce the volume of product that needs to be distill during the spirit run thus significantly reducing distillation time. It will also produce a better tasting alcohol. For example if we start with 50 Gallons of Wash we can strip this down to 10 Gallons of “low wines” and then run a single spirit run this will take much less time then doing 5 or 6 spirit runs. For 5 Gallons of wash you can expect the stripping run to yield approximately 1 Gallon of low wines. Thus the typical stripping run yield is 20% of original Mash volume. Common practice is to collect low wines until the stripping run temperature reaches 208 F or 98 C. Remember you don’t make any cuts during this distillation the primary goal is to strip off the water, yeast and sediment contained in the wash.
Can I Use A Reflux Still To Do A Stripping Run ? If you don’t have a pot still you can use your reflux still to do a stripping run by removing the packing from the column. Once you’ve completed several stripping runs it’s time to do a final product run aka a spirit run. During the spirit run you will be separating the heads, hearts and tails which will require you to pay close attention to your still, slow and steady is the key here. For anyone new to distilling I would recommend you check out this “How To Guide For Cuts and Fractions”which explains how to properly separate heads, heats and tails during the spirit run. If you’ve got any questions feel free to drop me a line in the comments. Why is my moonshine cloudy ? 33 Responses to "Stripping Run – Using A Pot Still For Distillation Of Moonshine"
you don’t run a still at a temperature, the temperature is determined by the ABV in the wash, hence you will see the boiler temp start well below 98 degrees C and slowly rise through the run, just exactlty as detailed in the graph…..Adding more heat simply speeds up the process. The appropriate amount of energy to add is determined by the quality of the spirit you want. Run the strip hot and low and slow for the spirit run. If you are getting 96.5 Abv in your spirit run, then that seems pretty good. Regarding the graph you included, What do the numbers 1 through 20 represent above the colored bars? 1 through 20 represents a run split into 20 small containers. It’s meant to give you a basic understanding of the volume of foreshots, heads, tails, water and ethanol as the distillation process progresses during a run. Hi Jim Thanks for noticing that. When I made the chart I miss labelled the legend. Got er fixed now. We are doing a stripping run so I wouldn’t separate them into mason jars, instead use a large glass jar for collecting. When you do your final spirit run separate your take off into 500 ml mason jars and then blend and make cuts! Here is a Guide to Blending Your Cuts you may find helpful ! Once you achieve the temperature of 78 to 82° C how long till you get drip from the pot still? In my experience you see product coming out of the pot still right away sometimes even before you reach 78 C because of the Methanol and Acetone that can be present remember their boiling points are lower then 78! Acetone – 56.5C (134F) Methanol (wood alcohol) – 64C (147F) hence why you always discard the first bit. Hi, earl. For a stripping run (as opposed to a spirit run) – do you discard or collect the foreshots? I would collect and discard foreshots ( approximately 50 ml per 5 Gallon charge) during both the stripping and spirit run! Some people would argue you only need to discard foreshots during the spirit run. If you choose this method you will need to collect more foreshots ( 100 ml ) should be adequate. Yes I would leave out the copper mesh for the stripping run as this will allow the still to quickly remove as much alcohol from the mash as possible. I’m running a 35 L Alembic pot still with 30 L batches of fruit mash for my stripping runs (low wines)… Collecting the strip down to the 30-40 proof or 90-91 deg C on the dome temp. Will be running the same volume batch with the low wines and thinking about discarding the first 300 mL as my fore-shots, then making my feints cut at 60 proof or 88 deg C.
Hey Tony this sounds good .. I like to make my cuts more based on taste and smell then temp and proof measurements! Have you tried this method before ? To do this I ind it easiest to collect your run into small mason jars and then blend and making cuts. For more info on this read this Guide to Blending Pot Still Cuts. Anyone else have advice for Tony ? Great site Earl and many thanks for the collection of information. Making sure I understand this correctly. During the stripping run column packing is removed and there are no cuts or discarding of foreshore containing acetone/methanol? Then during the spirit run column packing is used and cuts are made and foreshore discarded? Im assuming the above diagram would not apply to the spirit run, or only briefly, as the concentrations of alcohol would be much higher during this run? I’ll be back for the book you recommended soon. Method #2 Collect and discard foreshots only on the spirit run ( 100 ml ) should be adequate. Anyone got an opinion on which is better ? And your correct the above diagram only applies to the stripping run! What is the difference between strength of boilers (single, double, triple etc) in both the stripping run and spirit run…. Obviously speed of the run… but does this affect quality and yield in both runs such as more unfavourable compounds spilling over to the hearts? slower heat increase the better…? After you do a stripping run, do you need to cut the low wines or run them again as is? I have a 5 gallon alembic still with a thumper and taking the low wines from 2 runs and will do a spirit run with both. Just wasn’t sure if I need to cut that down or run as is. I would top up your still with some water as you don’t wan’t the heating element to become exposed ! I’m very glad to find a place and someone who makes sense to a complete newcomer like me Earl, thank you for that. I have one question though that I haven’t seen a satisfactory answer to and it is this, what do you do with the alcohol collected on a stripping run, minus the nasty foreshots of course, do you distil it all again? Yes a Stripping run’s purpose is to remove the alcohol from the wash very fast. This method is usually used when you’re fermenting more wash then your still can handle in a single run. Once you have done several stripping runs you dump everything you’ve collected back into the still and do a final product run paying particular attention to making cuts and fractions. Where can I find for information on the spirit run? Please correct me if I am wrong, but a spirit run would be additional distillation on the the stripping run? Here’s a typical set up for a thumper keg and pot still with an explanation on how it works.